I am an internationally certified Yoga Teacher, registered with Yoga Alliance. 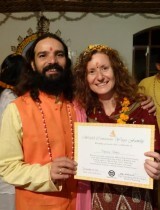 I completed my initial 200-hour training at The Ayurvedic Institute in Albuquerque, New Mexico, and graduated from Anand Prakash ashram in Rishikesh, India with my YTT500 certification in 2012. I am trained to teach a variety of yoga styles, however, I currently specialize in Restorative Yoga, AyurYoga and Yoga for Hormonal Balance. I travel a lot and therefore teach mainly workshops and private sessions in Germany, England and India. You can find out more about my schedule on the News & Events section on this webpage, on my Yoga Trail page or on my Facebook page. Yoga has been my life for the past decade. I’ve been practicing Hatha Yoga since my early 20′s, however didn’t get hooked until I was in my early thirties, when I participated in a six month foundation course with the British Wheel of Yoga. It was during this course, and during complementary studies in Kundalini Yoga, that I discovered my love for yogic philosophy, meditation and the more subtle practices of yoga. After living yoga in such a pure form in India and experiencing its transformational potential first-hand, my life has never been the same again. Back in the UK, I moved to Shekinashram in Glastonbury, UK, where I delved deeply into the Bhakti Yoga practices under the guidance of Elahn Keshava, in particular yajna (sacrificial fire ceremonies) and kirtan chanting. I also took initiation into the Satyananda Yoga tradition in 2009, which solidified my commitment to the yogic path even more. In 2010, I decided that it was time to formalize my yogic knowledge with a teacher’s qualification, and left England to study at the Ayurvedic Institute in the USA. The one-year long training in Ayurveda included a 200-hour Yoga Teacher Training module, which specialized in AyurYoga and adapting different yoga practices for therapeutic use. Two years later, in 2012, I felt it was time to return to Anand Prakash ashram and Yogi Vishvketu, and studied with him for a further two months to complete my 500-hour teacher training. During that time, I also qualified as a Yogic Lifestyle coach under the guidance of Robin Campbell. Yogic Lifestyle coaching is a healing modality for clients seeking ways to optimize health and wellbeing, such as during stressful life situations, and you can find out more about it here: Yogic Lifestyle Counselling and Yogic Lifestyle Counselling 2. Now, my whole life revolves around yoga. The practice has completely transformed me from the inside out. I am more aware, more peaceful and much happier and healthier than I was in the past. Like many people, I’d started yoga for physical reasons, and on the way discovered a wonderful, deep wisdom tradition that led me into places of inner peace and bliss that I never thought existed. As a teacher, I want to share my love for yoga, and it is my intention to bring inspiration, mindfulness, deep relaxation and joy into my classes. Yoga for me is all about transformation. As we grow more and more aware through our practices, we evolve toward the freedom and joy that is our true nature. To book a private session, either for Yoga or Yogic Lifestyle Counselling, please contact me. Sessions cost £45 per hour.